Shown is the covered bridge in Lynchburg, where authorities extinguished a fire Monday that has been deemed suspicious. State authorities are investigating a suspicious fire at the 149-year-old covered bridge in Lynchburg, officials said Tuesday. Lynchburg Area Joint Fire and Ambulance District Assistant Chief Justin Allen told The Times-Gazette that crews extinguished a fire at the covered bridge on High Street in the village Monday night, and authorities are seeking information on the cause. Allen said the Ohio State Fire Marshal’s Office was contacted and investigators have already been to the scene. Allen said if anyone has information on the matter or observed suspicious activity at the bridge Monday night, they should contact the district at 937-364-2915 or the fire marshal at 1-800-589-2728. While there was no apparent exterior damage to the bridge Tuesday, Allen said the fire “had some effect on the structure.” He said engineers would make the final ruling. The bridge, originally opened in 1870, spans the east fork of the Little Miami River and connects Highland County and Clinton County. In 1969, a new bridge was constructed nearby over the east fork Little Miami River, allowing access to Lynchburg from Clinton County. 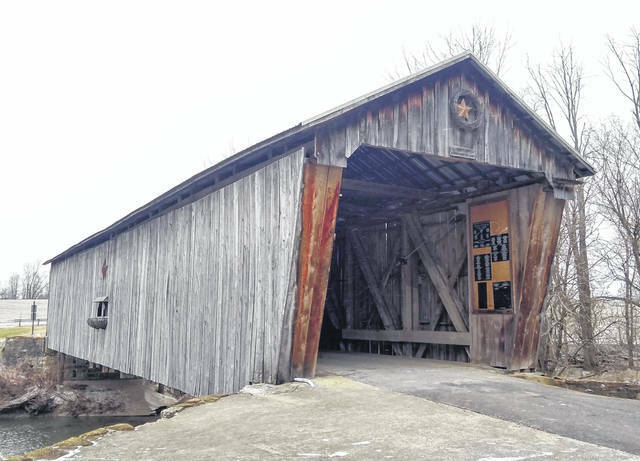 The Lynchburg Covered Bridge was retired from active service and closed to traffic, and Clinton County relinquished rights to the bridge, according to various sources. Five years later, the bridge sustained severe storm damage when high winds blew most of the roof into the east fork Little Miami River. Materials were donated for repairs, and the Lynchburg Historical Foundation launched a fundraising campaign, which brought in $6,000 for repairs. The restoration and renovation was eventually carried out by volunteers. The bridge was refurbished again between 2003 and 2005, according to a plaque on the bridge.